This article appeared in the July 2012 Rural Policy Matters. June and July have found the Rural Trust Global Teacher Fellows in the midst of international travel. From Tokyo to Buenos Aires, Gujarat to Kenya, and points in between, these rural teachers report that they are experiencing more than they ever imagined. 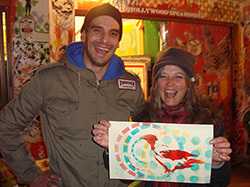 Karyn Neubauer with Artist Dario Malatesta in Buenos Aires. Neubauer shows some of her original art work. 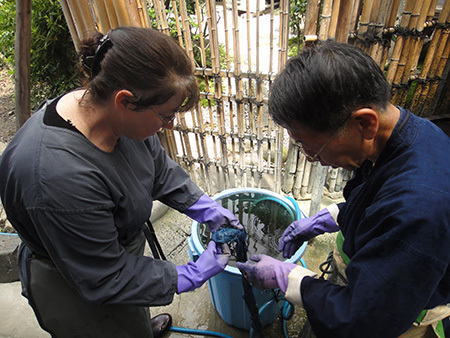 Joy-Lyn McDonald dyeing Indigo at the Aizenkobo workshop in Kyoto, Japan. 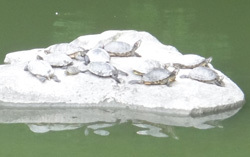 It is crowded everywhere - even on a rock in the pond in the Imperial Gardens in Kyoto. 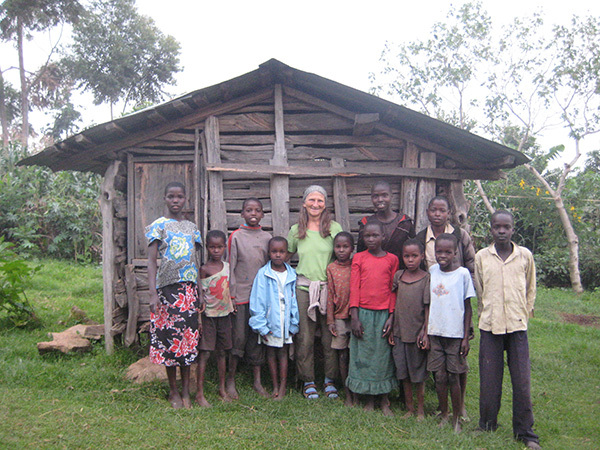 Annie Gibavic with neighbor children in the village of Kamagap, Kenya. 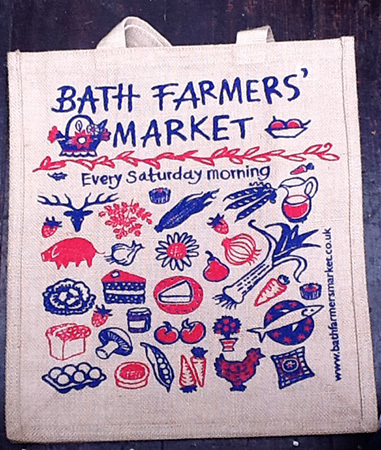 Shopping bag for the Bath Farmers’ Market, Bath, England. 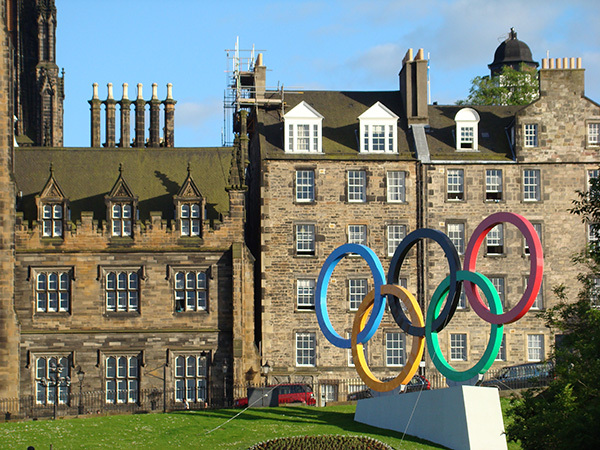 Symbols of the 2012 London Olympics on The Mound in front of the General Assembly Hall of the Church of Scotland. 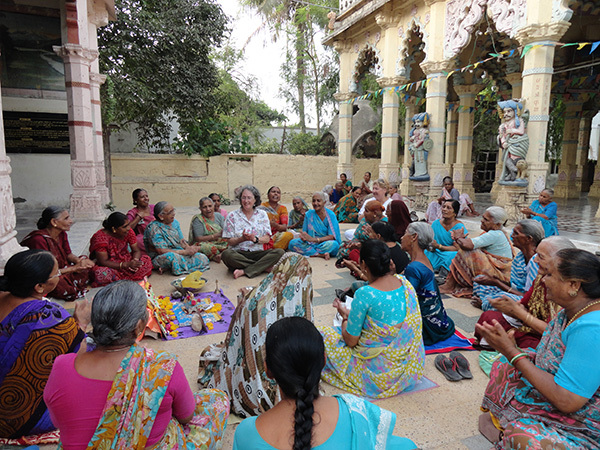 Gloria Waggoner and Marta Coleman at a temple in Porbandor, birthplace of Mahatma Gandhi. That’s exactly the goal of the Global Fellows program, which awards up to 25 fellowships each year to support the professional and personal development of rural teachers. Participants design summer learning experiences from which they develop interdisciplinary place-based learning curricula aligned with state and local content standards. In the July issue we’ll follow along with about half the travelers. The teachers have shared some great photographs and inspiring reflections. Next month we will hear from the rest of the 2012 Rural Trust Global Teacher Fellows. 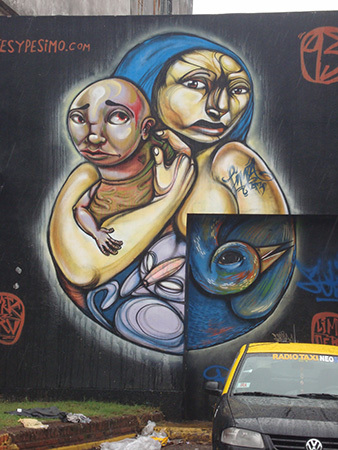 Karyn Neubauer and Dana Brettell immersed themselves in street art in Buenos Aires, Argentina. Neubauer teaches visual arts and Brettell teaches Spanish at Thetford Academy, the designated public high school for Thetford, Vermont. 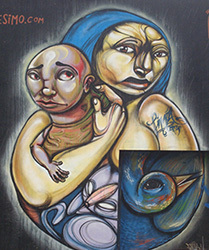 Brettell says that she has been struck by the “melting-pot” atmosphere of Buenos Aires with its mix of Italian, Spanish, and indigenous people. “I am enjoying observing the level of acceptance and even respect for these artists' collaborative ways of working together, which reflects the society they live in,” she observes. 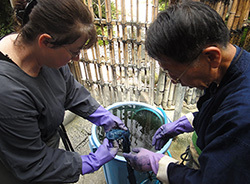 Joy-Lyn and David McDonald, science teachers at Sidney High School in Sidney, Montana, traveled to Japan to study the ancient art of indigo dyeing. The indigo plant produces a blue pigment, and the traditional Japanese process for dyeing with indigo is not only beautiful, but is said to add durability and even insect resistance to fabrics. Joy-Lyn writes that many of the indigo craftsmen are quite elderly and that some historical crafts seem to be dying out in Japan. 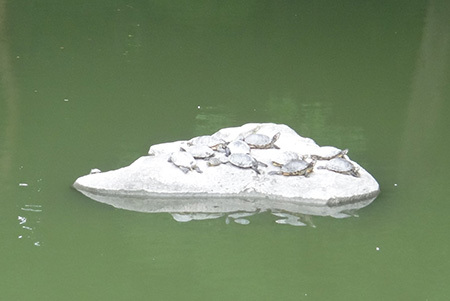 She also shares a whimsically captioned photo of turtles at the Imperial Gardens in Kyoto. 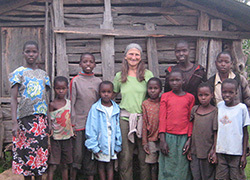 Annie Gibavic spent three weeks in the rural village of Kamagap, Kenya, where she taught English, made bricks for a new school, and taught local residents how to play baseball. Gibavic appreciates “the overwhelming welcome I received” and notes the similarities between the landscape of Kamagap with its “rolling hills, lush greenery, small farms, big rocks, cows and chickens” and her own village in Northern Vermont. 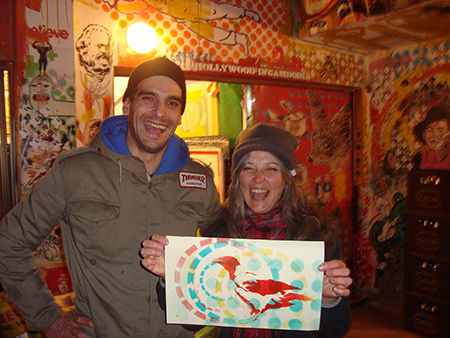 Gibavic teaches Art, Dance, and English as a Second Language at the K–8 Miller’s Run School in Sheffield, Vermont. Art teachers Jana Barrett (North Elementary, a K–8) and Elizabeth Bell (Grundy County High School) are interested in establishing a farmers’ and art market in their home communities in Grundy County, Tennessee. 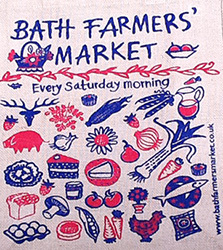 They travelled to the United Kingdom (UK), where they especially enjoyed the Bath Farmers’ Market, the oldest in the UK. They note that goods at the market, including baked goods and processed meats, are made with locally sourced products. Bell says they received “tremendous” encouragement and information from the Market’s Co-Directors. 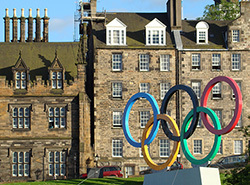 Barrett and Bell also enjoyed the excitement of the upcoming Olympic Games, which opened this month in London. Husband and wife, Corinne and Jose Galvan, also explored agricultural practice and policies in the United Kingdom. Corinne teaches agriculture at West Prairie High School in Colchester, Illinois, and Jose teaches 7th grade social studies at Macomb Junior High in Macomb, Illinois. The Galvans kept a blog, www.ourtriptoengland.wordpress.com, with text and videos from their trip. 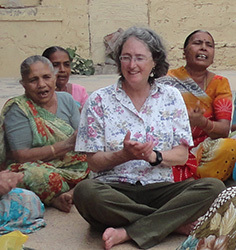 Gloria Waggoner and Marta Coleman record amazing adventures and gorgeous photographs from their experience in India in their blog http://ghsindia.wordpress.com. Waggoner teaches World History and Civics and Coleman teaches English and Social Studies at Gunnison High School in Colorado. The two spent nearly three weeks traveling across India, much of the time tracking the life of Mahatma Gandhi. Their travels included visits to schools, caves, ashrams, and workshops where workers hand craft all kinds of things from expensive paper to soap to silk thread to objects made from recycled plastic and metal. Look for updates from other Global Fellows in the August 2012 edition of RPM. Read more from the July 2012 Rural Policy Matters.